I am a firm believer that teachers need their own website for their class. Our students practically live on the web, so why not provide them with a website from your class? They will visit your site, as long as there is something on there, and I'm not just talking about your lesson plans. Students love going on teacher websites, so let's give them some! There are many great website builder options out there that require you to have zero programming skills. 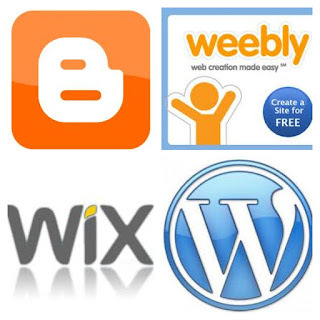 Website builders like blogger, wordpress, weebly, wix, or many others allow you to make a great, professional looking website with a small learning curve. These are all free website making machines. I use blogger to build/maintain Speartip, but have also used wordpress, weebly, and wix. I think they are all solid options for building a website. Perhaps you will find one that you think is better, such as shutterfly and google sites. Yes, making these websites take time, but I'm here to help! The impact they can have on your classes is enormous. Plus, I think once you start building, you will find that it's fun to have your own website. It's like having your own piece of the internet. I know you all use either google classroom or edmodo, which is great! It is still beneficial to have a website because there are things that you can or want to share that work better on a website. Classroom and Edmodo are management sites. A website is your central location on the internet for all things dealing with your class. 1. Extend the learning outside of your class time. 3. Post an "assignment calendar" so students and parents know when things are happening. 4. Create and share interactive assignments, review tools, and learning tools. 5. Gives students the opportunity to share their ideas and thoughts. (blogging comments). 6. Gives you another way of connecting with your students and getting them excited about your class. 7. Provides another (strong) communication channel. 8. Gives students a place to go for anything and everything about your class. They want this.